Unfortunately, the inexpensive nature of the Bic pen means that many of them find their way to the garbage. Because of their cheap construction, many people think of them as disposable. Bic reports that the pens can write over 2km, or 100,000 words but few pens actually last that long in the hands of consumers to be used that much (Bic Group, 2014). When it comes to recycling, Bic pens are out of luck. Because they are composed of many materials assembled together, it is difficult and inconvenient for consumers to separate and recycle. Even if they took the effort, only polypropylene and brass are truly recyclable. Polystyrene is one of the most harmful plastics as it takes an incredibly long time to decompose. 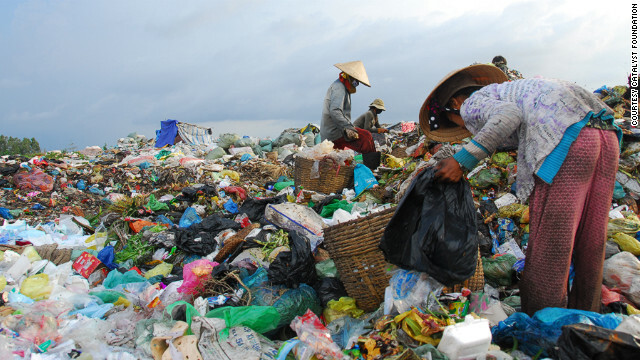 In many cases, waste including assembled objects (such as these pens) is outsourced to poor countries that accept waste from developed countries as seen below in a dump in Vietnam.